On 10 April 1944, 467 Squadron joined a force of 166 aircraft from 5 Group sent to attack the railway marshalling yards in Tours in central France. The Tours trip occupies an interesting period of the bomber offensive when ‘precision’ targets were being attacked more frequently than big cities, so, springboarding off my earlier Tours post, here is an examination of how tactics developed during this time. Tours and four other marshalling yards attacked that night were included in what was known as the Transportation Plan, part of the preparations for the upcoming invasion of Europe which by this time was less than two months away. The Plan called for the “destruction of thirty-seven railway centres in France, Belgium and western Germany, and especially of the locomotive depots and repair and maintenance facilities in these places, in order to prevent the flow of reinforcements and supplies for the German army in the invasion area.” A key aim was the avoidance wherever possible of French civilian casualties, so accuracy was a priority (indeed, Max Hastings recounts the internal battles between Harris and Churchill on one side and Eisenhower and Tedder on the other about the ability or otherwise of Bomber Command to be accurate enough for the task). The first railway target – Trappes in France – was attacked by 267 Halifaxes and Mosquitos on 6 March 1944 and over the next three weeks, Bomber Command would visit Le Mans, Amiens (twice), Laon, Aulnoye and Courtrai. By 10 May, the Lille raid was by my count the 43rd operation in the series, to a total of 26 distinct railway targets. For the first month or so of the Transportation Plan, the bombers used Parramatta tactics, very much like those used on German cities, where bombs were aimed at ground markers dropped by Oboe-equipped Mosquitos. The Main Force would attack in one or two waves, usually with a ‘reserve’ period in which the marking would be kept up for any late-running bombers. Crucially, on French targets crews were told not to drop their bombs until the markers went down and if no markers were visible at all, they were to bring their bombs back (as occurred for the second wave on Laon on 23 March). This was clearly an attempt to ensure bombs only fell, wherever possible, on the actual target and not on civilian housing nearby. Though these attacks were in the main reasonably successful, there were improvements that could be made. Oboe was normally a sufficiently accurate system for city-busting raids but it was fiddly to work with, occasionally failed and was sometimes not accurate enough for precision targets like marshalling yards. If the markers went wide, so did the bombs – a situation seen to varying degrees at Amiens on 15 March, Aulnoye on 25 March, Courtrai on 26 March and Lille on 9 April. In an apparent attempt to reduce French civilian losses (and to avoid wasted effort), on 10 April a Master Bomber was introduced to direct the second attack on Aulnoye. In this case the Mosquitos still dropped their markers by Oboe but instead of then heading for home they stuck around to direct the bombing by radio. This was, of course, the same night as the Tours operation. Tactics on this raid were somewhat different from the pattern which had become the ‘norm’. Surprisingly, no Mosquitos were sent to Tours and Oboe was not used. The raid was a 5 Group only affair. Lancasters dropped white ‘hooded’ flares to illuminate the ground, and the Master Bomber himself – flying a Lancaster – marked the target visually, by their light. The Main Force attacked in two waves and whilst the first part was highly accurate, the second was hampered by the smoke and flames caused by the earlier raiders and there was subsequently a delay while the Master Bomber re-marked the target. The Tours trip occurred during a period of clear weather and a three-quarter moon, which meant reasonably bright conditions for bombing and resulted in accurate marking. The vast majority of subsequent railway operations were conducted with another refinement in tactics, which would have helped when the general light levels were not so bright. The pattern was set on 18 April 1944 on a marshalling yard at Juvisy, near Paris. Oboe Mosquitos would first drop their ground markers, followed immediately by illuminating flares by Lancasters in the Newhaven style. The Master Bomber would assess the fall of the target indicators by the light of the flares, determine the required correction or even drop his own markers and instruct the Main Force to attack accordingly. The results, when everything went to plan, were immediate and effective. Juvisy suffered “immense” damage. 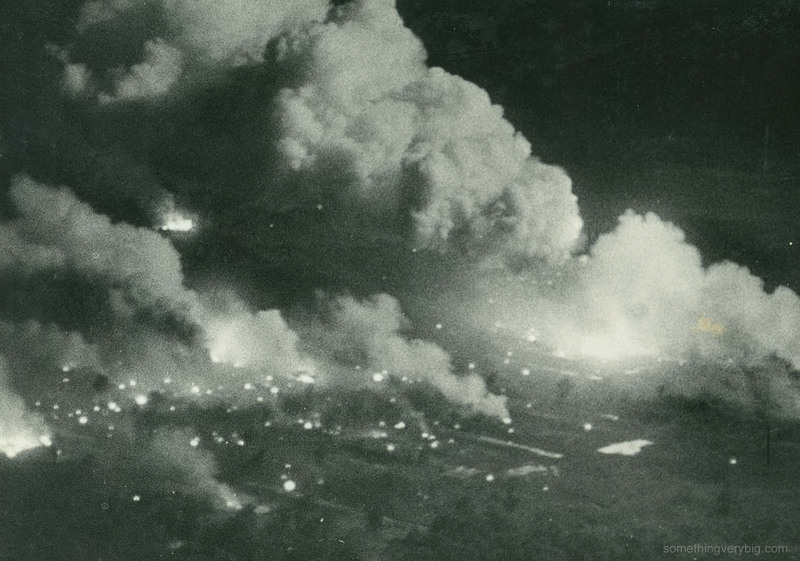 On the same night, Rouen got “exceptionally severe” effects from a “magnificent” concentration of bombing. The problem, however, was when things went wrong. At Tergnier, also on 18 April, the Oboe Mosquitos failed and the visual markers fell wide. So did the bombing. Communications between the Master Bomber and the Main Force were absolutely critical. It was an unwieldy system because if the Master Bomber was in a Mosquito he could not talk directly to the Main Force. The VHF radios in the Mosquitos were in relative short supply, so a ‘Controller,’ whose Lancaster had been fitted with one of the VHF radios, was required to relay instructions to the rest of the Main Force over standard radio and wireless telegraphy. When communications failed, so, on many occasions, did the bombing, such as what happened to the second wave at Villeneuve-St-George on 26 April and Malines on 1 May. But when everything worked it proved most effective in highlighting which target indicators the crews should aim at. On 6 May, for example, 143 aircraft attacked the marshalling yards at Mantes-Gassicourt. The first Oboe marking failed so the illuminating flares dropped first, followed by three loads of target indicators which were scattered wide of the aiming point. Crews were ordered to bomb in between all sets of markers, until a salvo of reds landed bang on the aiming point. The Master Bomber was able to adjust and instruct crews to aim at the new, accurate, markers, until more reds fell off the target. The resulting confusion was resolved when a set of white markers was dropped accurately, but by now smoke and fire obscured all the indicators, so the Master Bomber ordered crews to simply aim at the fires. Had the Master Bomber not been there, or had the radio been jammed or otherwise unavailable, the raid would certainly have been far more scattered than it was. The other issue with direct marking of the aiming point happened when the bombing was, well, too good and the markers were obscured by smoke. This, of course, is what happened following the first wave of the attack on Tours, and it happened again at La Chappelle on 20 April. On this occasion the aiming point requiring remarking slightly away from the original target indicators. Yet another development in target marking was devised to counter this. It was first deployed in an attack against an airfield at Lanveoc-Poulmic, near Brest, on 8 May. Here the markers were deliberately dropped upwind of the actual aiming point. The Master Bomber would determine how far away and in what direction from the aiming point the markers had fallen and then calculate a ‘false bombing wind’ which could be fed into bombsights. The theory was that, if the sight was aimed at the marker, the adjusted wind setting would ensure that the bombs themselves landed on the real aiming point. It was a good theory and the resulting bombing was highly accurate. The only problem was that it took time for the markers to be dropped and assessed and for the false bombing wind to be calculated. The Main Force was timed to arrive having allowed sufficient time for the process to be completed but it needed good communications and good timing from all crews to be practical. The next night the new system was used again. The date was 10 May 1944, and the target was Lille. Like the Tours trip, this used slightly different tactics to others in use at the time. While the three other railway raids carried out on the same night (to Courtrai, Ghent and Lens) all used Oboe Mosquitos, the target at Lille was marked visually under the light of illuminating flares – a classic Newhaven attack. Unfortunately what happened was exactly what offset marking was intended to avoid, when the first markers were extinguished by the early bombing, perhaps because crews were not yet used to the new tactics and simply forgot to apply the correction. After a short period the master bomber called a halt to proceedings so that new markers could be dropped, but it appears the resulting delay of some 20 minutes allowed the defences to get their act together, and they extracted a heavy price. Twelve out of 89 aircraft failed to return, among them B for Baker. Waddington awoke in shock. Last night, 31 Lancasters had taken off for a ‘milk run’ operation to Lille. This morning, though, there were six empty spaces at the dispersals – and 42 empty beds. But war waits for no man. Ops were on again tonight. Preparations were put into place for 25 Lancasters to attack a military camp at Bourg Leopold in Belgium. They began taking off just before 22:00. But incorrect forecast winds delayed the marking over the target and thick haze compounded the issue so, after about half the bombers had bombed the leader called the attack off and ordered remaining crews to take their bombs home. The Bourg Leopold raid was the biggest of the night, with 190 Lancasters and three Mosquitos taking part. Elsewhere marshalling yards were attacked at Hasselt (north-eastern Belgium), Louvain (near Rennes) and Boulogne. Coastal batteries were hit at Trouville (south of Le Havre) and Colline Beaumont (near Le Touquet). “Only at Louvain was any widespread damage caused,” said the Night Raid report. But in a cruel blow to 467 Squadron, a night after losing a Flight Commander (Phil Smith) and two other pilots and all of their crews, another bomber failed to return from operations. And amongst this crew were some extremely experienced and capable men. LL792 was being flown by Sam Balmer, the 467 Squadron Commanding Officer who was on his final trip with the Squadron before going to a new posting and who (though apparently he did not know it) had just been promoted to Wing Commander. Among his ‘scratch crew’ was navigator Flying Officer Peter Hammond, a second-tour man who had arrived at Waddington five days ago with the new ‘B’ Flight Commander, Squadron Leader Lloyd Deignan. And on the final trip of his first tour was Flight Lieutenant WR Norden-Hare, the Squadron’s Gunnery Leader. Along with four other RAF men, all were killed when the aircraft crashed near Antwerp after being attacked by a nightfighter on their bombing run. In happier news for 467 Squadron, though, it had been calculated that their venerable Lancaster R5868 S for Sugar achieved on the Bourg Leopold trip its 100th operational sortie. But not without a scare. Flown for the occasion by Pilot Officer Tom Scholefield, the crew were continuously attacked by a pair of Ju 88s for nearly ten minutes. But some good cooperation between the gunners and the wireless operator, who was directing them via the Monica early warning system, managed to drive off “9 or 10 determined and skilful attacks.” They did not bomb – jettisoning their ‘cookie’ over the sea on the way home – and returned safely. Meanwhile in and around Lille French civilians and the German occupiers were discovering the extent of the damage wrought by the previous night’s chaos. The railways were clearly out of commission for the time being. But the bombing had also spread east of the target and residential property was badly damaged in that area. More than one thousand houses were destroyed, many by fire, and about 150 French civilians were killed with some 57 injuries recorded. Adding to the destruction was the wreckage of ten Lancasters which had crashed in and around the target area. And those ten Lancasters contained ten crews, a total of seventy men. During the day on 11 May bodies of airmen were discovered in and around the target area. Some were found close to where their aircraft had crashed. At least one was stuck up a tree. Late in the evening of 11 May the burials began. Around 9pm 22 bodies were brought to Forest-sur-Marque, near where at least three Lancasters are thought to have crashed. The burials were carried out under difficult conditions. The Germans ordered the townspeople to dig one long common grave and that the dead were to be buried “by 8am.” The Germans supplied no crosses or coffins. Burials would continue throughout the area over the next few days. But unknown to anyone else, one of the 70 men shot down near Lille was still alive. Phil Smith had passed the day hiding out in a wood in northern France, sleeping on and off and hearing no sound bar the occasional train passing some distance away. In the dawn hours it was pretty cold and I missed the raincoat which I had worn on all recent operations – this one was to be pretty short and the weather was warming up. When it became dark, Phil began to walk again. Along the way he found an animal trough with which to fill his water pouch and, with the aid of the sterilising tablets he was able to get all the drink he needed. Phil continued on towards the south-east and, he hoped, Switzerland. Crews were initially told to aim 50 yards from a red spot fire but after about ten minutes the bombing had blown out or obscured the markers and Phil instructed the remaining crews to just bomb the concentration of fires. “Considered it would have been impracticable to re-mark”, Phil reported afterwards, perhaps keeping in mind the disastrous consequences of the delay at Mailly-le-Camp three nights ago. A number of crews reported being able to feel the explosions over the target at their bombing height and the footage, which is soundless but spectacular, shows clearly how bumpy flying conditions were. And the 467 Squadron Operational Record Book claims that it was taken after the biggest of the explosions had died down. Explosions were still occurring as the bombers left the target for the almost uneventful trip home. Defences were almost ludicrously light with a few fighters seen but no attacks reported and only a few light guns at the target which, Pilot Officer Bill Felstead reckoned, were “immediately put out of action at [the] beginning of [the] attack.” Flying Officer Bruce Buckham was coned by searchlights crossing the coast on the way back but the accompanying flak that they were expecting never came up. A concentration of damage occurred within the target area, while the surrounding country escaped almost unscathed. And best of all, every aircraft returned safely from Sable-sur-Sarthe. Much of the circumstances of tonight’s operation were broadly similar to those three nights ago at Mailly-le-Camp – the bright, clear, moonlit night, the general tactics used and the damage caused to the target – but at Mailly of course the casualties were very much greater. So what was different? While the weather and tactics were similar for both raids – moonlight, a datum point to hold the Main Force while the aiming point was marked, a Master Bomber to make the decisions and a Controller to pass orders to the Main Force – at Sable-sur-Sarthe the force used was very much smaller than at Mailly and the single aiming point avoided complicating the scheduled timeline of attack. This simplified things significantly and provided less opportunity for things to go wrong. Perhaps haunted by memories of the disaster of Mailly-le-Camp, crews after tonight’s operation were clearly happy that there was no delay over the datum point. “Effect on enthusiasm of crew, when one can go straight in and bomb, very noticeable,” thought Pilot Officer Arthur Bowman. Tonight, once the target was marked, in a very accurate and timely manner, the Main Force was called in without needing to orbit over enemy territory. The single wave of attackers did not need to wait for a previous force to vacate the target, which is what compounded the delay originally caused by the faulty communications at Mailly. Sable-sur-Sarthe showed that getting straight in and straight out minimised the chances of nightfighters getting stuck into the bombers. Mailly showed what could happen when crews were forced into extended orbiting over enemy territory. The next major raid undertaken over France by the crews of 463 and 467 Squadrons would prove, once again, how fatal delays could be. Preparations, meanwhile, were underway for operations tonight for the crews of 463 and 467 Squadrons. In all 64 Lancasters of the Main Force would be joined by four target-marking Mosquitos, all of 5 Group, to attack a munitions dump between the townships of Sable-sur-Sarthe and Louaille, in western France. The Master Bomber for this raid was Squadron Leader Harry Locke, a former 463 Squadron man now of 97 Squadron and based at Coningsby, and the role of Deputy Controller was given to one of Waddington’s most experienced pilots: Squadron Leader Phil Smith. I duly went over there in our Oxford aircraft, a type I had not flown for more than a year. I received a cold reception there, which seemed surprising. Obviously our Group Captain had not prepared the ground for me and the Coningsby people were very security conscious. This incident did not harm the cooperation experienced during the raid. Coningsby was the headquarters station of No. 54 Base, which also included Woodhall Spa and nearby Metheringham. It was a short flight, Phil’s logbook recording 30 minutes for the return trip. The tactics to be discussed for the night’s operation were simple. A datum point about fifteen miles north-east of the target was to be marked with green target indicators. (Phil suggests that Oboe may have been used here but the Night Raid Report does not specifically mention it.) The four 627 Squadron Mosquitos would then mark the aiming point itself with red spot fires, and “the main force were to bomb as directed by the Master Bomber or his deputy” – who was Phil Smith. H-Hour was set down for 02.45. There were eleven crews on the 463 Squadron battle order tonight, accompanied by twelve from 467 Squadron. 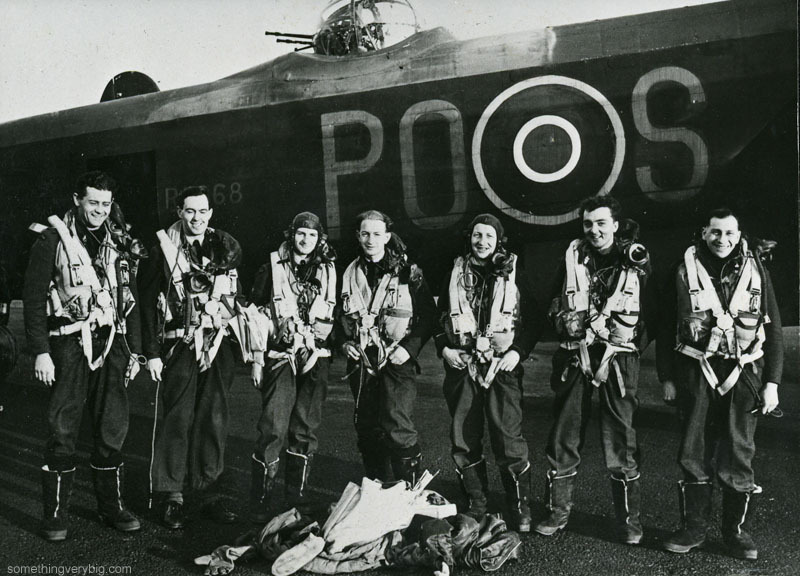 One of the latter was captained by Wing Commander ‘Willie’ Tait, the Base Operations Commander, who took ED953 with a standard crew plus two extras: Pilot Officer Morris and Flight Sergeant Kimberley, photographers from the RAF Film Unit. The aircraft had been specially fitted out with cameras to record what was evidently expected to be a spectacular raid. As usual, of course, there were other raids taking place tonight as well. The Transportation Plan continued with more than 140 aircraft attacking railway yards in Mantes-Gassicourt, 30 miles west of Paris. While the Night Raid Report says it was an “accurate and damaging attack in moonlight” and that “damage and destruction were most severe in the stores depot, locomotive shed and repair shops” the Campaign Diary shows that local records suggest some of the bombing fell outside the target, in the western part of the town and the nearby hamlet of Dennemont. There were only two active flak guns but fighters apparently caught up with the bombers on the way home and three heavies were lost. Elsewhere 52 Lancasters went to another munitions dump, this time near Aubigné in central-western France. This was a highly accurate attack resulting in “sheets of flame [coming] from the exploding ammunition, and dense smoke up to 5,000’.” The entire target, continues the Night Raid Report, was “almost completely destroyed” for the loss of just one aircraft which fell to a fighter on the way home. Other operations tonight included Mosquitos attacking Chateudun, Ludwigshafen and Leverkusen and various airfields in France, Holland and Belgium. There were also the usual minelaying, leaflet and special operations and fighter patrols. One Mosquito failed to return.